Request E-waste Pick Up: USC Environmental Health & Safety collects e-waste at no cost. Fill out the Universal Waste Pickup Request Form to arrange service. (323) 442-2200 or ehs@usc.edu for more information. 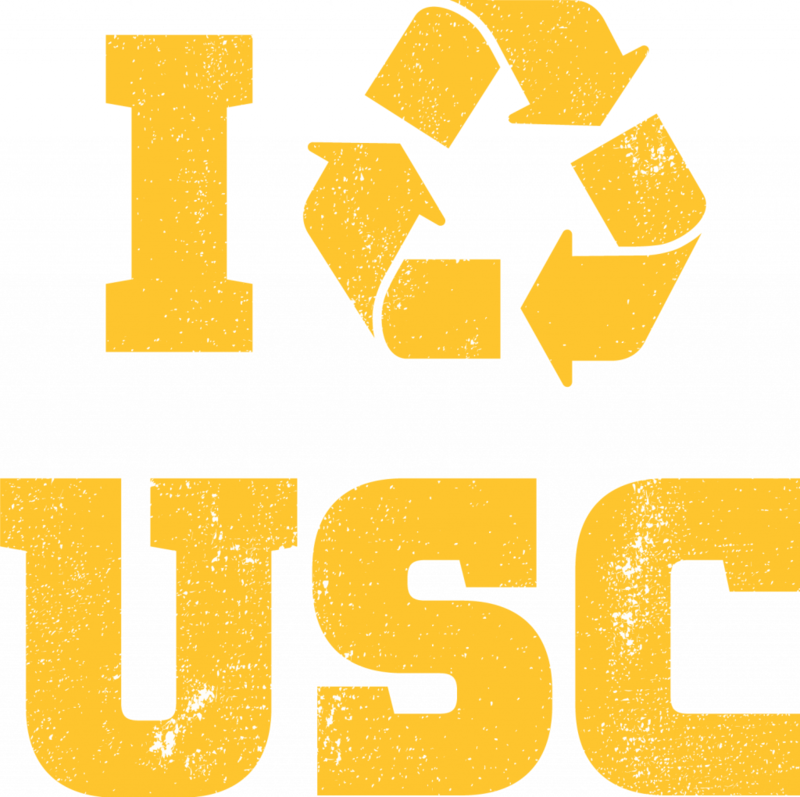 Request a Recycling Bin: Email Gina Whisenant at USC Facilities Management Services, gwhisena@usc.edu. past few years. With this goal, USC aligns itself with the City of Los Angeles’ recycLA mandate of 90 percent waste diversion by 2025.
recycling and landfill disposal. USC and Republic are employing proven waste diversion tools such as recycling, composting, and metrics analysis to help achieve our 75 percent goal. China’s recent ban on imported recyclables is having an enormous negative impact on landfill and the market for recycled materials. Given this recent change, it is critical that Trojans re-think our approach to trash. straws. Also, minimize use of plastics – choose glass packaging (or no packaging) instead of plastic whenever possible. “Wish-cycling” – putting non-recyclable items in the recycling bin – is worse than not recycling at all. Greasy pizza boxes, foil wrappers and left-overs will “contaminate” a recycling bin; just a few wrong items results in the entire bin going to landfill. A good rule of thumb: when in doubt, throw it out. This fall, USC is launching a major campus-wide waste diversion education campaign, including new bin signage that explains what goes where. Landfill is expensive and produces Green House Gas emissions. Since 2001, average landfill rates in LA have almost doubled from $34 per ton to $54 per ton. By diverting our campus waste from landfill, USC saves money. In addition, waste diversion has the added benefit reducing USC’s carbon footprint. It’s estimated that a 1% increase in recycling could provide an annual net savings equivalent to 200,000 metric tons of carbon dioxide. Los Angeles Memorial Coliseum: The Coliseum, home of the USC Trojans football program, has won the Pac 12’s Zero Waste Bowl for the last two years. The stadium diverts more than 90 percent of Trojans and Rams football game-day waste from local landfills through recycling and composting. Academic and Administrative buildings + outdoor spaces: This year, USC installed 106 trash bins, 84 recycling bins, and 15 composting bins at UPC and USC Village. Bin signage will provide “Trojans Recycle Right” instructions. USC Housing: On-campus residents, including the USC Village, sort waste into blue recycling and black landfill bins in-room. Bins are emptied in separate trash chutes and transferred to dedicated dumpsters. Off- campus residents separate recycling and trash as well. USC Housing also recycles old furniture with IRN, and gives used carpets to a recycling vendor. USC Administrative Offices: USC office occupants sort waste into blue recycling bins, black mixed-waste bins, and various e-waste receptacles. Waste is deposited in the appropriate container at each office building’s external waste enclosure. USC Hospitality: Hospitality does not utilize trays in residential dining halls, which reduces food waste by discouraging plate overloading. And starting in this fall, Residential Dining will begin composting food and banning straws. Hospitality separates recyclables in all venues. Cardboard recycling: FMS collects, sorts and recycles cardboard from all buildings on both campuses. Styrofoam recycling: FMS runs a Styrofoam recycling program at the Health Sciences campus, running Styrofoam through a densifier to minimize storage and provide a higher value commodity. With the exception of the Coliseum, USC employs food composting as a waste diversion tool on an ad hoc basis on campus. Dining areas compost food in their enclosures, the School of Religion composts in its kitchen, and all University Village retail outlets have composting facilities with staff at each location being trained in appropriate practices. The Coliseum is a controlled environment that allows for optimizing waste diversion including composting, which results in our “Zero Waste” (above 90 percent) diversion rate. products contaminate the waste stream. Midstream, the Coliseum’s custodial services provider facilitates a low-fi but efficient waste separation process that operates back-of-house during football games and events. Downstream, the Coliseum’s waste hauler Republic Services ensures that waste separation is maintained throughout pickup, delivery, re-sort, recycling or composting disposal, and metrics reporting. Because of the waste diversion management “lessons learned” at the Coliseum, USC Hospitality now is working to achieve zero waste in Residential Dining by 2020, and USC Athletics is studying the feasibility of going zero waste in Heritage Hall and the Galen Center. January 1, 2018: State Air Resource Board to implement a strategy to reduce emissions of short-lived climate pollutants to achieve a reduction in methane by 40%, hydrofluorocarbon gases by 40%, and anthropogenic black carbon by 50% below 2013 levels by 2030. Also established specified targets for reducing organic waste in landfills. shall arrange for recycling services. The mandatory organics recycling law requires a business that meets the waste generation threshold to engage in organic recycling activities. Summer/Fall 2021: CalRecycle may expand to cover businesses that generate 2 cubic yards or more of commercial solid waste per week. Join Our Team and Help Make Waste History at USC! The Sustainability Office is hiring students this fall to work on a number of campaigns, including the Trojan Trash Talkers – student ambassadors who engage fans about recycling during campus tailgates. Contact us at sustainability@usc.edu to get involved!